Note: This post first appeared on Colorín Colorado February 16, 2018 and complements a blog written by Larry Ferlazzo. That piece is titled Grading English Language Learners – A Perspective From Two Teachers. We have recently discovered that there is a lack of resources in our field about how to equitably grade English language learners (ELLs). 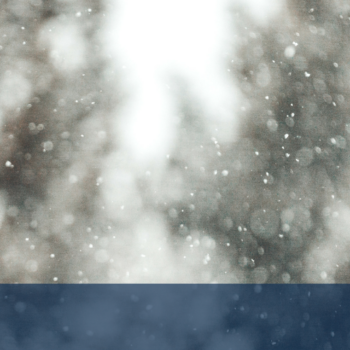 This blog post offers some insights and ideas that we hope will spur further discussion. First, we’ll share the reason behind our focus on this topic, as well as a summary of challenges related to grading ELLs. Next, we’ll give you a brief overview of related research before sharing our own recommendations developed in response to our research, which we call the Five Pillars of Equitably Grading ELLs. We’ll end the post by providing a space for you to share your thoughts, add some additional resources, and share some references with you. And if you are interested in learning more, join us for our upcoming webinar on this topic in March! Diane and special guest expert Larry Ferlazzo will discuss challenges in equitably grading ELs, provide you with a new framework of EL grading strategies you can implement, and answer your questions on this important topic. When you are equipped with practical tools to equitably grade ELs, you improve your students’ chances to demonstrate their academic and personal growth. Free registration is available here. As part of developing a blended ELL assessment professional development course for the Mid-State Regional Bilingual Education Resource Network in Central New York State, we were asked to create a component on grading ELLs. We thought our task would be straightforward enough, but once we started researching the topic, we found very limited resources specifically for ELLs. We’re doing a little research on grading ELs at SupportEd. Could you please share your answers to these questions? 1. What are the challenges that you and your colleagues may have in grading ELs? 2. What are some strategies or tools that you find particularly helpful in grading ELs? 3. Do you have any exemplary EL-friendly report card samples you can share? The responses were numerous and came quickly. Many of our online colleagues shared that they were also looking for guidance around this topic. We also took part in a Twitter #ELLCHAT on January 8 on the same topic with a similar response from colleagues around the country. (You can see a transcript from that Twitter chat by registering for a free account from Participate.com.) We’ll summarize the top three challenges that we read about next. Please note we don’t share answers to questions 2 and 3 since we incorporate some resources to address these questions in our Five Pillars. Lack of validity in grading content: One comment was, “Sometimes a child’s grades are just a reflection of how well the teacher taught to their learning style, rather than a true representation of what the child knows.” Another colleague wrote, “Separating ELD from content knowledge! So integral to each other – how to assess accurately? ?” She noted these are listed separately on report card, but there is no tool to assess them. Challenges with school or district policy: Often, educators commented that existing policies at the school and district level don’t address the unique considerations inherent in grading ELLs, such as inflexible time limits for exemption from letter grades regardless of the students’ language proficiency and educational backgrounds. The challenges our colleagues reported on social media are in line with what the research tells us, namely that there are many obstacles that may prevent ELLs from benefiting from equitable grading practices. Here we summarize some of findings from relevant research. Please note that this is not an exhaustive literature review! Research shows that grading, even among teachers at schools with clear grading policies, is often inconsistent (Reeves, 2008; Seeley, 1994). This inconsistency can lead to inequitable grading practices and even failure for certain groups of students, such as ELLs (Waldsburger, 2012). Many teachers believe that report card grades should be based solely on students’ mastery of grade-level content standards, which can be challenging for some students. Jung and Guskey (2012) note that while an ESOL teacher may complete a supplemental progress report for ELLs, that piece of assessment information does not often support the general education teacher in assigning grades. Another obstacle in grading in general is that many classroom teachers feel uncertain about how to hold all students to the same expectations for performance as other students (Guskey, 2011). Teachers can find it challenging to differentiate instruction and grading for ELLs while trying to meet the needs of the other students in their classroom (Pawan & Craig, 2011). Even those teachers who are able to differentiate instruction may find it difficult to score learning tasks and assign grades based on differentiated student work. Still another challenge that stands in the way of equitable grading for all students is the belief that grades should be used to identify and maximize differences among students (Guskey, 2011). Many teachers feel that there should be students who perform well and students who perform poorly, such as with a normal bell-shaped curve. Jung and Guskey (2012) share that teachers often grapple with questions of fairness, such as giving a passing grade to an ELL who did not meet grade-level content standards. However, Guskey (2011) notes that when teachers identify what they want students to learn and be able to do and when they do all they can to support students in meeting these goals, it is possible for all students to obtain high scores on academic tasks and thereby receive high grades. The literature we reviewed notes several recommendations for improving ELL grading systems as a whole (e.g., Waldsburger, 2012). For example, one recommendation is not giving letter grades to newly arrived ELLs who are beginning to learn English. Another option is to provide narrative assessments only or use a system of pass, fail, and high pass that measures effort, language growth, and content standard mastery based on students’ levels of language proficiency. Tomlinson (2001) suggests providing two grades for all students. The first would be a traditional, standards-based grade, and the second would be a grade based on an individual student’s progress towards language and content learning goals. Similarly, several authors (e.g., Jung & Guskey, 2010; Tomlinson, Moon, & Imbeau, 2015) recommend three grades for differentiated classrooms based on a student’s product (mastery of content), process (effort, motivation, and participation), and progress (improvement over time). We drew from our colleagues’ responses, the research we synthesized on grading ELLs, our review of best practices in ELL grading, as well as our own expertise in the field to create five recommendations for equitably grading ELLs. 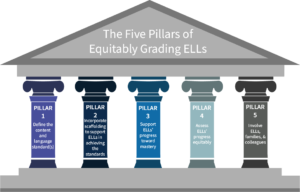 We call them the Five Pillars of Equitably Grading ELLs. For each pillar, we provide a few steps to incorporate that pillar. In defining and describing the five pillars, we fully realize how intertwined effective instruction and equitable grading are. You simply can’t fairly grade ELLs if you haven’t already positioned them to access the instruction of content. Pillar 1: Identify the content and language standard(s). In setting up a system in which ELLs can be graded fairly, teachers first need to define which content as well as language standards they would like their students to meet. Hand in hand with these two sets of standards go content and language learning objectives for ELLs based on these standards. We recommend that teachers share these content and language learning objectives with ELLs using “student-friendly” versions to the degree possible. Also, we recommend that teachers identify success criteria for ELLs in meeting the objectives, and share models of strong work samples with ELLs so that students aware of teachers’ expectations. Model work samples should also include models produced by ELLs at different levels of proficiency so ELLs can see themselves reflected in exemplary student work. Pillar 2: Incorporate scaffolding to support ELLs in achieving the standards. Depending on their level of English proficiency, most ELLs will not be able to access grade-level content standards without appropriate scaffolding. We recommend using three types of scaffolds in the areas of materials, instruction, and strategic grouping of students to work toward removing linguistic barriers for ELLs. In implementing scaffolds, we recommend you do so based on ELLs’ English language proficiency level as well as individual ELL strengths and needs and also the demands of the particular lesson (Staehr Fenner & Snyder, 2017). In addition, we recommend that teachers set expectations with students for the gradual removal of scaffolding, as appropriate. ELLs should be aware that scaffolds are temporary and will be removed as they gain language proficiency and content knowledge and skills. Further, we stress that it’s crucial for ESOL and content teachers to collaborate to determine appropriate scaffolds for their ELLs to meaningfully access content. Pillar 3: Support ELLs’ progress toward mastery. We believe that grades should not be used punitively for any students, and especially not for ELLs who are already more inclined to drop out of school than non-ELLs. 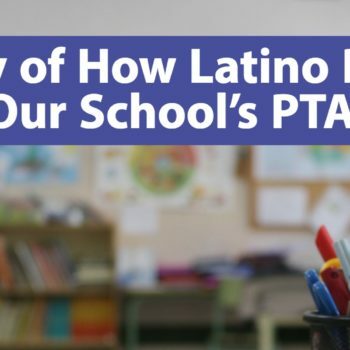 Therefore, we suggest providing ELLs sufficient time and opportunities for learning, such as offering “lunch bunch” and after-school opportunities to do schoolwork with guidance from teachers, tutors, or peers. In addition, we recommend focusing on ELLs’ progress towards mastery as well as their achievement. It is important to underscore that we are evaluating ELLs’ progress towards mastery, not just whether they have mastered the objective or not. In spite of careful scaffolding, all grade-level standards may not always be 100% achievable for certain ELLs. It may be more motivating for an ELL to recognize his or her progress than to see an achievement score alone. Also, since many ELLs have responsibilities such as work and taking care of siblings outside of school, they may not be able to complete all assignments on time. Therefore, we recommend allowing ELLs to turn in some work late without penalty if they are in communication with the teacher about the unique circumstances. Moreover, late work may be a sign that an ELL is needing more support to be able to access the content, understand the directions, and/or complete the task. Finally, if homework is given, we recommend using it as an opportunity for non-graded practice. Pillar 4: Assess ELLs’ progress equitably. In order to equitably assess ELLs, teachers need to design assessments and supports that allow ELLs to access and demonstrate mastery of content and/or language objectives. To equitably assess ELLs’ progress, it is critical to also scaffold assessments (not just instruction) for ELLs based on individual ELL strengths and needs. For example, depending on an ELL’s level of English proficiency, that student could be provided sentence frames, images, or a word bank to lighten the “linguistic load” of the assessment to be able to provide a more valid picture of what that student knows and can do in a particular content area. During instruction, ELLs should have ample classroom opportunity to practice with any scaffold that will also be provided during an assessment. Another aspect of equitably assessing ELLs’ progress comes in the form of group work. While we recommend strategically grouping ELLs as a form of scaffolding instruction, for grading group work we recommend assigning individual scores instead of a group grade to students, including ELLs. In this way, individual students aren’t penalized if all students aren’t contributing equally to a particular group project. Pillar 5: Involve ELLs, families, & colleagues. We have often found that ELLs and their families do not have a full understanding of grade-level expectations, how grades are given, and what each section of a report card means. We advocate for explaining grade level expectations, the grading process, and report cards to ELLs in their home language whenever possible. In addition, ELLs and their families should be involved in the entire grading process, beginning the school year or their enrollment in school with an overview of what the grading expectations and processes look like. Such meetings are also a good time for ELLs and their families to set goals for their learning. Finally, while collaboration and co-teaching have been on many teachers’ radar for some time now, co-grading may not be. We strongly recommend that ESOL and content teachers co-grade, collaborating to assign grades to ELLs on formative and summative assessments as well as discuss final grades on report cards. In that way, the level of collaboration will strengthen, and all teachers can leverage their expertise when it comes to ELLs. While we offer our ideas on guidance around equitably grading ELLs, we also encourage you to share your thoughts here. If you have any samples of ELL-friendly report cards, grading policies, success stories, or additional considerations, please share them in the blog post comments! Guskey, T. (2011). Five obstacles to grading reform. Educational Leadership, 69(3), 16-21. Jung, L. A., & Guskey, T. R. (2010). Grading exceptional learners. Educational Leadership, 67(5), 31–35. Jung, L.A. & Guskey, T. R. (2012). Grading exceptional and struggling learners. Thousand Oaks, CA: Corwin. Pawan, F. & Craig, D. (2011). ESL and content area teacher responses to discussions on English language learner instruction. TESOL Journal, 2(3), 293-311. Reeves, D. (2008). Leading to change: Effective grading practices. Educational Leadership, 65(5), 85-87. Seeley, M.M. (1994). The Mismatch Between Assessment and Grading. National Education Association. National Education Association. Retrieved from https://www.nea.org/teachexperience/ ask040326.html. Staehr Fenner, D., & Snyder, S. (2017). Unlocking English learners’ potential: Strategies for making content accessible. Thousand Oaks, CA: Corwin. Tomlinson, C. A. (2001). Grading for success. Educational Leadership, 58(6), 12-15. Waldspurger, T. (2012, March). A? B? C? Assigning meaningful grades for ELLs. Presented at the TESOL Convention, Philadelphia, PA.